"Mountains? Who goes to the mountains?" In this slapsticky 1995 comedy, geared broadly at the pre-teen set, Daniel Stern stars as a dopey delivery guy framed for the murder of a mysterious and wealthy man. Opting to go on the run to clear his name, rather than go the authorities (where's the fun in that? ), Stern's Max Gribelski has to head to a remote mountain top called Devil's Peak in order to retrieve a package that will theoretically prove his innocence. With the law hot on his tail, a mix-up has city boy Max mistaken for a seasoned scout leader who is scheduled to take a troop of young, inexperienced Ranger Scouts on an overnight, conveniently very near Devil's Peak. That's essentially your comedic setup right there, with Stern's Max as the proverbial fish-out-of-water, complete with leather car coat and Italian dress shoes, trudging through the great outdoors, with a pack of one-note stereotypical scouts (the fat kid, the short kid, the tough kid, the nerdy kid, the smart girl, etc) in tow. Max is a coarse, clueless chain-smoker, and in true family-friendly fashion, somehow ultimately manages to dispense some actual knowledge to his charges, and of course earn their loyalty. The humor is largely physical, with Stern getting attacked along the way by a swarm of bees, a giant bear, to say nothing of assorted falls, trips and tumbles. He survives the same kind of cartoonish abuse and violence he received in the Home Alone films, all delivered here with a wildly bug-eyed exasperation that is equally as over-the-top. Aside from a cute Saturday Night Fever sendup during the opening credits and a couple of Cliffhanger take offs, there isn't really any subtlety to the humor to appeal to an older demographic, so if you don't favor broad, Tex Avery-styled comedy, you likely won't find much else here to hang your hat on. Veteran television director Greg Beeman (JAG, Nash Bridges, Providence) hauled in a couple of decent supporting players, with Coen Brothers staple Jon Polito as the FBI agent tracking Max, and Brad Sullivan as a tough-as-nails scout leader seemingly styled as a PG version of R. Lee Ermey. Polito, who can easily steal a movie (see Miller's Crossing if you need proof) is sadly underused, and he is left with doing nothing but a toned down take on his usual gruff, tough guy routine, in between scenes of Stern getting beaten up by Mother Nature. 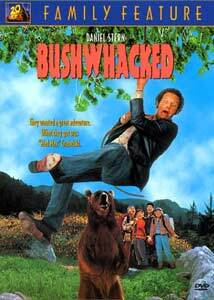 Bushwhacked exists solely for its goofy physical comedy, like the scouts urinating off a cliff onto an FBI agent, and the revelations about who framed Max and why were fairly hard to follow for me (not that I'm a rocket scientist, mind you). The looseness and rushed feel of that element of the achingly simplistic plot seemed horribly unexplained, even in the face of the repetitive branch-in-the-face kind of humor that is so prevalent in the rest of the film; as the bad guys prattled on, I'm sure younger viewers were simply twiddling their thumbs waiting for the next pain-induced sight gag. Image Transfer Review: Fox has included a pair of very nice looking transfers on this two-sided, dual-layered disc, in both 2.35:1 anamorphic widescreen and 1.33:1 full-frame. Colors are deep and exceedingly well saturated, with solid blacks. Considering this is a dumb little family comedy, I was honestly surprised at how good this print looked (opting as I did for the widescreen version), and aside from a few sporadic bits of wear, the transfer was unexpectedly impressive. Very minor edge enhancement and compression artifacts are evident, but are negligible. Kudos to Fox and DVCC on the transfer, and for including the 2.35:1 widescreen version, as well. Audio Transfer Review: Well, what the image transfer giveth, the audio transfer taketh away. The 2.0 surround track is alarmingly flat, with no real dynamic range to speak of. Dialogue and Bill Conti's score are crammed into the front speakers like ten pounds in a five pound bag. Rear channels get used almost by accident it seems, and there is very little in the way of noticeable depth to the presentation. Occasional clipping on some of the louder chunks of dialogue was also evident. French and Spanish 2.0 surround tracks are also provided. The disc is cut into 28 chapters, and includes subtitles in English and Spanish. This is a lightweight comedy, heavy on Home Alone-type pratfall comedy. Daniel Stern is fun to watch as the bumbling Max Gribelski, but the level of humor rarely rises above the six-grade level. Dumb stuff, but perfect for a family night rental.